Oh my word! I had the best lechón (spitted and roasted suckling pig) the other day in a Cuban restaurante called El Floridita. 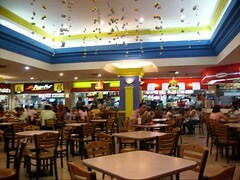 I was at the Plaza Inter mall in Managua, Nicaragua and that's where I ate it. The owner told me he has another restaurant in the Plaza de las Américas mall near Bello Horizonte, Managua. The stuff was off the charts. I paid C$120 for that plate of food with a Coke. Looks like they have a great selection of Cuban food so I will be back!!!! BTW, Nicaragua has a close relationship with Cuba, both historically and culturally. There are remnants of Cuban's past influence in Nicaragua, particularly in a few good Cuban restaurants around town.